Pixar Planet • View topic - Monsters, Inc. Coaster coming 2011! Monsters, Inc. Coaster coming 2011! 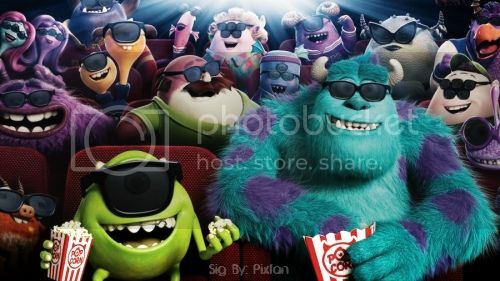 Talk about Pixar's Monsters, Inc. and Monsters University here! finally i really wanted more to that pixar place than just toy story mania at disney world. I knew they were going to transform some part of Disney World into a Pixar Part. I must go back to florida and check it out. I wonder when they can consider putting in some Incredibles themed stuff in there? Well Pixar Place HAS been there (at DHS) but now they're expanding it so it's truly Pixar Place, not "Toy Story Midway Mania, a meet and greet and a shop" Place. It's only been open for about 2 months (with earlier soft openings) and it's already extremely popular. It's got the same brick building feeling of Pixar at Emeryville and it even has a smaller sign that say Pixar Studios (note it doesn't say Animation Studios) I think it was too small to fit. It's pretty packed though, and this is kind of random, but there's a cool "street" sign that says Pixar Place with Luxo Jr. on top of it. Wow, that actually sounds pretty cool! It's great that Pixar are really getting their own section of the theme park, and I have to say that the new Monsters, Inc. ride sounds pretty thrilling! Oooh, sounds interesting. Do you think it might be better than the "Mike and Sulley's Adventure"? I am Andrew Ryan and I am here to ask you a question: Is a man not entitled to the sweat of his brow? Location: Home of the Beach Boys, Southern California. I definitely think so, primarily because it's a coaster instead of a dark ride. I think I remember it being mentioned in the Monster's Inc. commentary that they wanted to see that scene with the doors become a ride. If it wasn't the commentary, it was somewhere else. I certainly remember that being mentioned. Pretty neat now that it's actually gonna be a ride, eh? Wow that sounds really fun! I like the sound of how depending on how the people on the ride react with their screams and cheering on how it affects the ride. Cool.......I'll keep my eye out for this one. Highly anticipated....Hope Disney doesn't screw this one up. Sorry for the rumor control... But this is only a rumor. Based off of that link, I don't know how reliable it can be. It sounded like some kid wrote an essay of his dream ride, giving every detail that would be on the ride. NO a Monsters Inc. ride has never been announced by Disney, and if it was, there would never be that much detail about the attraction so sudden. Last year Disney announced a Cars ride at DCA, yet we still know nothing about the attraction, as far as story or what the heck it will be about goes. Also, there is already a Monsters Inc. attraction at WDW. Some blog on the internet is NEVER a reliable source when not even it can back up its claims with proof. Until this attraction is announced by Disney themselves, this rumor is just a rumor - just like the millions of other Disney parks rumors I hear all the time that always die down the road as false. I'd think since your name is Disney_Guy, you'd know who Jim Hill is. He's a very popular Disney blogger with many insiders. He knows what's going on, in fact, he's not a kid, he's actually very old. martini833 wrote: I'd think since your name is Disney_Guy, you'd know who Jim Hill is. He's a very popular Disney blogger with many insiders. He knows what's going on, in fact, he's not a kid, he's actually very old. I see Disney related rumors all the time from all kinds of sources including Jim Hill. Much of the time they are false, or for whatever reason, just die after a while. I'm not new to this whole rumors business, and basically what I said in my last post was until Disney announces this, I will then believe it. No need for me to get worked up over a blogger (I don't care if he's Jim Hill or not), it's not an official source. As for WALL-E, are you talking about last year's Comic-Con? Because even I knew of the plot way then. I read it from something Andrew Stanton wrote that was already released by Disney (Sorry to be really vague, but this was over a year ago). Actually Martini - I've been at this a long time and if there's one thing I know it's take everything Jim Hill says with a grain of salt... and then some. Jim is not a very reliable source with a good track record.